Today, I came across an article from #1 VMware blogger Duncan Epping of yellow-bricks.com fame, that pointed me to Chris Colotti's also excellent blog at chriscolotti.us. The specific article that caught my attention was about this small (8MB) Windows utility, intended to be left running in your system tray, perfect for monitoring a single ESX host, such as my vZilla. See also my accompanying video below, a dive into the product's installation and functions. It appears to only use about 59MB of RAM, and CPU utilization never seems to rise above 0%. As far as my new VMs, well, you can see, at a glance, that I've wildly over-provisioned memory: time to prune back the vCenter Appliance and vZilla RAM assigments quite a bit, or tune the settings to not turn to red quite so early. In the coming days, I'll avoid reboots of my workstation, to watch for signs of application misbehavior over time, such as resource utilization growth (signs of a memory leak), CPU spikes, etc. Here's a look at a section of the integrated browser-based help, it's what comes up when you click the '?' button. Click the image to view the entire help system! The take home message is that it still works! AN OPEN LETTER TO SOLARWINDS CUSTOMERS, PARTNERS AND IT COMMUNITY FROM: KEVIN B. THOMPSON, CEO, SOLARWINDS, INC.
Last week, SolarWinds announced that it entered into a definitive agreement to be acquired by leading private equity technology investment firms Silver Lake Partners and Thoma Bravo, LLC. Becoming a private company simply means that we can better fulfill our mission to provide superior, purpose-built products that make IT and DevOps professionals’ jobs easier across the globe. This transaction is good for SolarWinds, our customers, employees and partners because we now have more freedom and flexibility to make the necessary R&D investments that allow us to extend our value in networking, storage, virtualization, database, and security. 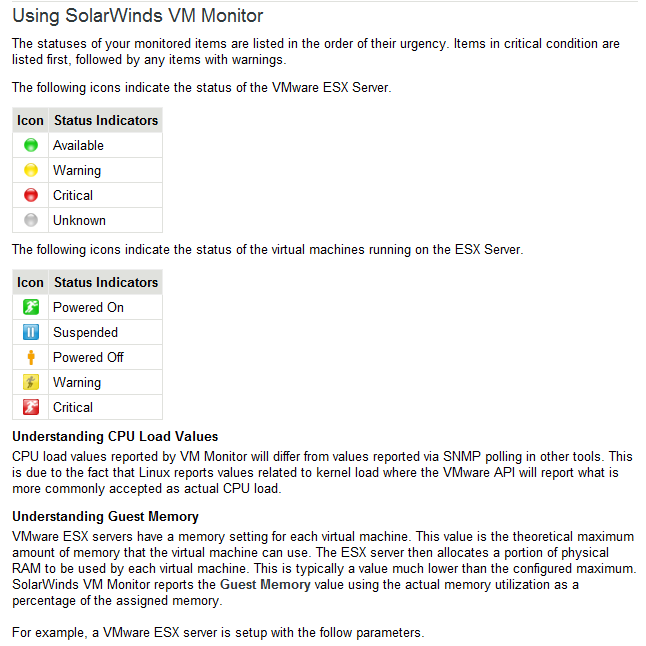 SolarWinds was created by IT pros for IT pros. Our dedication to offering affordable products that are easy to use and deliver value to your business is core to who we are as a company. This commitment is what has made SolarWinds a great company since 1999, and we believe this acquisition will help us serve you even better going forward.